N.C., 20th-century U.S. pathologist. See: Foot reticulin impregnation stain. 2. A unit of length, containing 12 inches, equal to 30.48 cm. 1. the distal portion of the leg, upon which an individual stands and walks; in humans, the tarsus, metatarsus, phalanges, and the surrounding tissue. 2. something resembling this structure. 3. a unit of linear measure, 12 inches, equal to 0.3048 meter. cleft foot a congenitally deformed foot in which the division between the third and fourth toes extends into the metatarsal region, often with ectrodactyly. dangle foot , drop foot footdrop. Madura foot mycetoma of the foot. march foot painful swelling of the foot, usually with fracture of a metatarsal bone, after excessive foot strain. pericapillary end foot , perivascular foot, sucker foot a terminal expansion of the cytoplasmic process of an astrocyte against the wall of a capillary in the central nervous system. trench foot a condition of the feet resembling frostbite, due to the prolonged action of water on the skin combined with circulatory disturbance due to cold and inaction. 1. The lower extremity of the vertebrate leg that is in direct contact with the ground in standing or walking. 2. A structure used for locomotion or attachment in an invertebrate animal, such as the muscular organ extending from the ventral side of a mollusk. 3. Abbr. ft. or ft A unit of length in the US Customary and British Imperial systems equal to 12 inches (0.3048 meter). See Table at measurement. the distal extremity of the leg, consisting of the tarsus, the metatarsus, and the phalanges. Anatomy The distal part of the lower extremity on which a person stands and uses to walk Components Tarsal bones, metatarsal bones, phalanges, muscles, tendons, nerves, blood vessels, soft tissues. See Athlete's foot, Claw foot, Club foot, Diabetic foot, Green foot, Immersion foot, March foot, Rocker bottom foot, Skew foot, Trench foot, Tropical immersion foot. 1. The distal part of the leg. Synonym(s): pes (1) [TA] . 2. A unit to measure length, containing 12 inches, equal to 30.48 cm. The feet, esp. the webbing between the toes, should be carefully dried after bathing. Well-ventilated shoes and absorbent socks should be worn. Topically applied antifungal drugs, such as terbinafine, effectively treat the condition except when maceration is prominent and bacterial infection is also present. In these instances, oral antibiotics are needed. A condition in which a cleft extends between the digits to the metatarsal region, usually due to a missing digit and metatarsal. A condition of the feet, resulting from prolonged immersion in cold water, in which pain and inflammation are followed by swelling, discoloration, and numbness. A colloquial term for tarsal tunnel syndrome. An insidious fracture of one of the metatarsal bones of the foot. Non-filarial lymphatic obstruction of the legs, commonly found in volcanic regions of Africa, where it occurs primarily in those who walk barefoot on alkaline, mineral-rich soil. An artificial foot designed to absorb the impact of foot-to-floor contact with a dynamic elastic structure. Twisted foot in locomotor ataxia. Degeneration of the skin of the feet due to prolonged exposure to moisture. The condition, which resembles frostbite, may be prevented by ensuring that clean, dry socks are worn at all times. The feet do not have to be exposed to cold to develop this condition. Solid ankle cushion heel foot; a prosthetic foot that has no definite ankle joint but is designed to absorb shock and allow movement of the shank over the foot during ambulation. the part of the leg of vertebrates that contacts the ground in the standing position. the locomotive organ in invertebrates, for example, the foot of a mollusc, or the tube feet of an echinoderm. Bones of the right foot, from above. Figure 1: The autonomic nervous system. 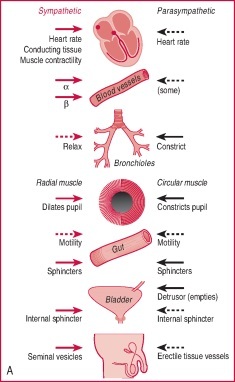 Actions on the heart and on smooth muscle. Sympathetic actions on the left and parasympathetic actions on the right. Solid arrows: stimulation (contraction or secretion); broken arrows: inhibition. as well as supporting the weight of the body, the foot works as a lever to move the body forwards. 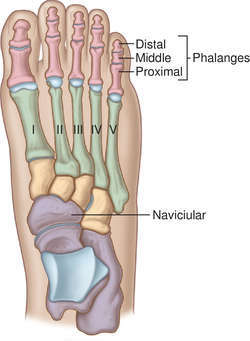 The many joints between the bones of the foot allow it to change shape to accommodate different and uneven surfaces. 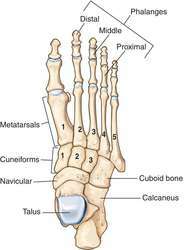 The skeleton of the foot consists of: the seven tarsal bones, including the heel bone (calcaneum) and the talus which articulates with the leg bones at the ankle joint; beyond these, the five metatarsals and, in the toes, the phalanges. There are layers of small muscles in the sole, and tendons from the lower leg traverse the ankle to reach their various insertions in the sole and on the dorsum (upper part) of the foot. Figure 1. 1. [TA] The distal part of the leg. the distal part of the primate leg, upon which the individual stands and walks. Used loosely also instead of hoof, paw. in all species has characteristics of local inflammation. Special disease in sheep—abscess under horn either at toe or heel. Caused by Fusobacterium necrophorum. Severe lameness with pus discharging at coronet. Slow outbreaks occur in wet years. Footrot in pigs is really a foot abscess. See also porcine footrot. Called also toe abscess, heel abscess. used to describe a female of breeding age accompanied by its unweaned offspring, e.g. ewe with a lamb at foot. used in the control of footrot in sheep and cattle. Made of concrete or metal, preferably not metal because of the corrosive nature of copper sulfate solution. Deep enough to accommodate a 4 inch depth of solution, wide enough so that animals can stand on all four hooves in comfort, with a side fence to ensure that they do actually stand in the bath, and long enough to accommodate five to 10 animals, which need to stand in the solution for about 10 minutes. Solutions used include copper sulfate or formalin. In dairy cattle the foot bath may be at the entrance to the milking parlor so that cows walk through it twice each day. includes primary (insensitive) laminae of cornified material and secondary (sensitive) laminae comprising nerve endings, germinal epithelium and dermal structures in the horse's hoof. although it can result from various causes of irritation, through contact, this is a common clinical sign of atopy in dogs. the larvae of the fly booponusintonsus. large cytoplasmic processes extending from the internal lining epithelium of the glomerular capsule of the kidney and terminate on the basement membrane. dermatitis of the skin of the sheep's interdigital cleft. There is minor lifting of horn at the horn-skin junction but there is no underrunning and no odor. Avirulent strains of Dichelobacter nodosus are the cause; the introduction of virulent D. nodosus will result in severe footrot. Called also benign footrot. in dog conformation, a turned out foot. in dogs, a long, oval foot. Called also boat foot. See also laminitis. gerbils stomp their rear feet to signal territorialism; sheep do it with their front hooves as a threatening gesture, especially to flocking dogs.